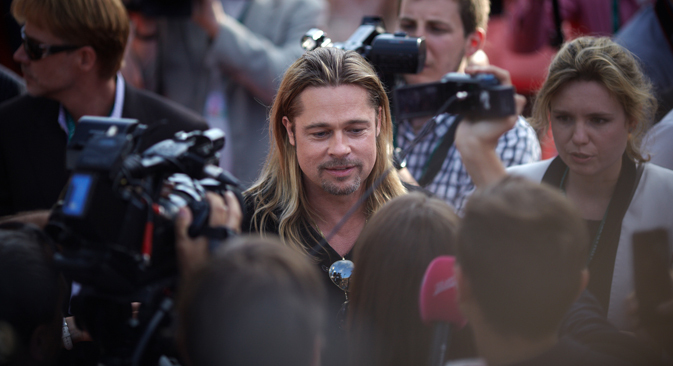 Hollywood superstar presented his new film, "World War Z", at the festival, which is taking place for the 35th time. One of the oldest film festivals around the world marks its 35th anniversary this year. According to official records, the Moscow International Film Festival (MIFF) started in 1959. However, the first festival dates back to 1935, when Sergei Eisenstein chaired the panel of judges. Over the years, the MIFF has granted awards to the masters of world cinema, including Akira Kurosawa, Federico Fellini and Ettore Scola. The Moscow International Film Festival opened on June 20th with the screening of "World War Z," directed by Marc Forster. It will continue by screening, in various Moscow theaters, sixteen competing films, two more than at previous festivals. In addition to the main competition, the festival will also hold a competition for the best documentary, selecting from seven competing films, including one on short film making. As every year, the event also includes the screening of a multitude of films that are not in competition. This year, for instance there will be “Almost All of Bertolucci,” a program entirely dedicated to the great Italian director, “Costa-Gavras. Opposition,” and a retrospective called “Meet Ursula Maier,” dedicated to the French-Swiss director who also resides on the panel of judges. In addition, there will be a retrospective program dedicated to the 70th anniversary of the battle of Stalingrad, which will, for the first time, screen films about both winners and losers. Other programs that are not in competition include a special section on Dutch cinema, to mark the Dutch-Russian year, a Portuguese section, a retrospective to celebrate the 75th anniversary of Rudolf Nureev's birth, and the “Freedom of Thought” program, for the screening of the best foreign documentary films. Needless to say, the festival will also include, as always, the best of Russian cinema. The festival will end on June 29th, with the screening of “Rasputin,” by Irakli Kvirikadze. Competing films can be seen at the official website of the Moscow International Film Festival.